Social networking giant Facebook said on Wednesday evening it may have “unintentionally uploaded” the email contacts of up to 1.5 million users on its site, without their permission or knowledge, when they signed up for new accounts since May 2016. Users affected by that incident were not just limited to the United States, according to a source familiar with the matter. Those contacts were not shared with anyone and Facebook is deleting them, a company spokesperson told CNBC. “We’ve fixed the underlying issue and are notifying people whose contacts were imported. People can also review and manage contacts they share with Facebook in their settings,” the spokesperson said. Black holes are some of the most intriguing and mysterious objects in the universe, inspiring entire libraries of both scientific research and science fiction, from Einstein to the movie Interstellar. Yet despite the hold that their inconceivable gravity has on our imaginations, as well as our understanding of physics, humans have never actually seen a black hole. That appears set to change Wednesday with the impending release of the first image taken of Sagittarius A, the black hole at the center of our Milky Way galaxy. It’s a landmark moment for both science and technology made possible by the Event Horizon Telescope, which is actually an array telescopes spread out across the Earth. The EHT is actually an array of radio telescopes on different sides of the globe that are linked to create what’s called a Very Long Baseline Interferometer (VLBI) the size of the Earth itself. The basic idea here is that radio telescopes in different locations are combining their signals to boost their power. If you’ve seen pictures of the Very Large Array in New Mexico (featured prominently in the 1997 movie Contact) with its multiple telescopic dishes all working together, then you can visualize the concept: Just imagine Jodie Foster tapping into an array of dishes that are separated not by meters but by thousands of miles instead. This planet-sized observatory is necessary because, as the Smithsonian Astrophysical Observatory explains in the below animation, while Sagittarius A is 4 million times as massive as our sun, it’s still really far away — a distance of about 26,000 light years. 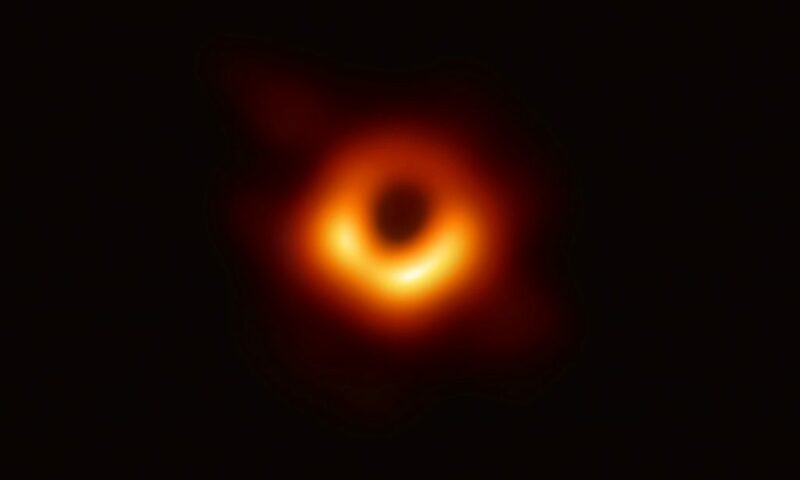 This is, of course, good news for all people interested in not getting sucked into a black hole, but it makes the thing very hard to photograph; it would be comparable to trying to see the dimples on a golf ball in Los Angeles… from New York. Better get out your super zoom lens, which is also kind of what the Event Horizon Telescope is. This seems like a good use of technology. A Wisconsin school district is testing a system that uses GPS on buses to track students, which officials say will help improve safety. Two buses used by the Hortonville Area School District have been keeping data on when students get on and off for the past two months. Wisconsin Public Radio reported. The buses have UniteGPS system tablets, which accept swipes from about 130 student identification cards. The information is sent to a website that school officials can access in real time. “Our parents appreciate the reasonable precautions we take to make sure that we not only provide a secure environment, but that we know exactly what’s going on in terms of their child’s safety,” said Scott Colantonio, technology director at the Hortonville district. The pilot program aims to allow the district to more easily track students who may get on the wrong bus or miss a bus transfer, which can leave parents worrying about where their kids are, said Harry Steenbock, the district’s transportation director. Issues occur on a daily basis, but happen more frequently when a substitute driver is on a route. Apparently, only liberal totalitarian ethics are appropriate for Google’s AI efforts. That’s a scary thought. He’s no fool. In an essay for the Washington Post, Zuckerberg calls for more regulation. This is a game that has been played for centuries. Now that Facebook sits atop the industry, Zuckerberg is advocating to freeze the structure and increase the barriers to entry. Complex legal structures with substantial financial liability for violations makes it impossible for all but the biggest and wealthiest of companies to comply. Interesting information. All in all, the greatest benefit seems to be for the officers. For years, many people hailed body-worn cameras as a potential key to improving police transparency and strengthening often-fractured relationships with the communities they serve. But so far, academic research suggests the technology largely hasn’t lived up to those expectations. That’s the conclusion of a new report from the Center for Evidence-Based Crime Policy at George Mason University. Researchers reviewed 70 empirical studies on body cameras’ effects, ranging from officer and citizen behavior to influences on law enforcement agencies as a whole. While much of the research remains mixed, it counters some promised benefits of body cameras at a time when departments are increasingly adopting the technology. “There is an incongruence between people’s expectations of cameras, police expectations of cameras and what they think they’re being used for,” says Cynthia Lum, the center’s director and a co-author of the report. What have we learned about the ability for a Wisconsin citizen to peer into the workings of our government? First, if a government wants to be obstinate, there is not much that a citizen can do about it. While the city of West Bend and Washington County were appropriately responsive and cooperative, the West Bend School District and board members threw up multiple roadblocks including ignoring requests and imposing an unnecessary and exorbitant fees. As a private citizen, all one can do is sue the government at great personal expense or file a complaint with the district attorney or attorney general. Historically, neither agency has ever been aggressive in enforcing open records laws. Government looks out for government. Second, all three governments are doing a poor job of retaining and making available public records to occur outside of government-provided technology. In our modern age, it is not uncommon for public officials to communicate with citizens, vendors, lobbyists, employees, and others through multiple digital channels including SMS, social media, and various chat technologies. In fact, this is becoming commonplace with the ubiquitousness of personal devices. If those public officials are using those technologies, they are creating a public record that should be open to public scrutiny for a reasonable amount of time. Otherwise, it is far too easy for our government officials to conduct themselves as angels in their official email while hiding their corruption in their personal devices. Every government needs to take the proactive step to implement policies regarding the preservation and retention of public records irrespective of format. Wisconsin has great laws regarding open records, but they are only as good as government officials are willing to obey and enforce them. We still have work to do to ensure that our government is open and accountable. Saudi Arabian courts will notify women by text message when their husbands have been granted divorces under a law that took effect Sunday. The initiative is aimed at concerns that Saudi men were increasingly neglecting to tell their wives they were divorced. Lawyer Somayya Al-Hindi told Okaz/Saudi Gazette that Saudi courts in the past heard many cases of Saudi women still living with their ex-husbands without realizing they had been divorced. Well, not technically Queen, but you get it. Cool Stuff. After the Pluto encounter, Stern asked Brian May, the Queen guitarist and astrophysicist, if he would compose a track to celebrate the Ultima Thule flyby. “I did scratch my head for a while,” said May. “The name is quite hard to conjure with. But then it came to me that this is about man’s desire to reach out into the universe and explore, and see things that have never been seen before. Little is known about Ultima Thule, or 2014 MU69, to use its official name. But based on preliminary observations, scientists think it may resemble a giant peanut with two large lobes fused together. The dark rock may contain frozen carbon monoxide, carbon dioxide, molecular nitrogen and methane, which may be exposed by impact craters on the surface. On the one hand, it is not unusual in government or private industry for a potential vendor to have relationships and try to influence an upcoming RFP. It is also not necessarily unethical. It can also be valuable for the government or business requesting the products or services by providing education and direction in a complex technology sector. On the other hand, this is a good reminder that big businesses love big government because they always have a seat at the trough. A top Amazon executive privately advised the Trump administration on the launch of a new internet portal that is expected to generate billions of dollars for the technology company and give it a dominant role in how the US government buys everything from paper clips to office chairs. Emails seen by the Guardian show that the Amazon executive Anne Rungcommunicated with a top official at the General Services Administration (GSA) about the approach the government would take to create the new portal, even before the legislation that created it – known to its critics as the “Amazon amendment” – was signed into law late last year. Amazon and the Trump administration appear to have an antagonistic relationship because of the president’s frequent Twitter attacks on the Amazon founder, Jeff Bezos, who also owns the Washington Post. But the behind-the-scenes lobbying by Amazon officials underscores how the company has quietly amassed an unrivalled position of power with the federal government. The 2017 correspondence between Rung – a former official in the Obama administration credited with transforming the federal government’s procurement policies before she joined Amazon – and Mary Davie at the GSA, offers new insights into how Amazon has used key former government officials it now employs – directly and as consultants – to gain influence and potentially shape lucrative government contracts. Looks like a probe to test responses. Or… some jackass teenagers with a warped sense of humor. Theresa May has said the government is working with Gatwick to try to resolve the impasse at the airport, which has been closed for more than 12 hours because of drones. The airport remains closed after what police and the airport described as a deliberate attempt to disrupt flights. Tens of thousands of travellers have been affected and the prime minister said she felt for them, but the government was doing what it could. May also defended the steps already taken to prevent misuse of drones. Earlier, he said the drones could not be shot down because of the risk posed by stray bullets. Officers from Surrey and Sussex police forces have been scouring the perimeter to try to catch the operators of two drones, which were first spotted at 9pm on Wednesday night, leading to flights being suspended. Sussex police said there was no indication that the ongoing incident was terrorism-related. Commuter Rail Coming to Southeast Wisconsin? A New York capital raising firm is helping a Wisconsin company attempt to raise more than $1.4 billion to support a private commuter rail project in metro Milwaukee along with related real estate development. The project by Transit Innovations LLC would use existing freight lines to create the commuter system, called E-Way. The company says it would build 21 new stations and use two existing ones along 55 miles of track across Milwaukee and Waukesha counties. Most of the capital, around 70 percent, would actually be used for real estate developments near the stations. Transit Innovations says developments would include market-rate housing, multifamily, retail, office, training facilities, mixed-use and manufacturing. The group estimates 7,000 units of new multi-family housing would be constructed. Transit Innovations, which was created in 2017 and is registered to a Brookfield address, is working with New York based Castle Placement LLC to raise the funds. An investor presentation estimates $571 million will come from real estate investors, $300 million from rail investors, $35 million from partners and local private equity and $550 million from a construction loan. I don’t know if it’s viable, but at least if it fails, it’s not my tax dollars being thrown down the tracks. While it seems that the era of autonomous vehicles is very close, and it might be, we still have a lot of work to do on the technology. And then we have a lot more work to do on our culture, legal systems, etc. to adapt to it. The passenger registers the stop sign and feels a sudden surge of panic as the car he’s sitting in speeds up. He opens his mouth to shout to the driver in the front, remembering – as he spots the train tearing towards them on the tracks ahead – that there is none. The train hits at 125mph, crushing the autonomous vehicle and instantly killing its occupant. This scenario is fictitious, but it highlights a very real flaw in current artificial intelligence frameworks. Over the past few years, there have been mounting examples of machines that can be made to see or hear things that aren’t there. By introducing ‘noise’ that scrambles their recognition systems, these machines can be made to hallucinate. In a worst-case scenario, they could ‘hallucinate’ a scenario as dangerous as the one above, despite the stop sign being clearly visible to human eyes, the machine fails to recognise it. Those working in AI describe such glitches as ‘adversarial examples’ or sometimes, more simply, as ‘weird events’. An industrial wind facility in Kewaunee County, Wisconsin has been decommissioned after just 20 years of service because the turbines are no longer cost effective to maintain and operate. The decommissioning of the 14 turbines took many people by surprise, even local government officials and the farmer who had five of the turbines on his property. Why Are We So Surprised? What’s really surprising about these wind turbines being decommissioned after 20 years is the is the fact that people were surprised by it. You’d be astonished at how many people I talk to that have no idea that wind turbines only last for 20 years, maybe 25. In fact, the National Renewable Energy Laboratory says the useful life of a wind turbine is only 20 years. In contrast to wind, coal, natural gas, and nuclear plants can run for a very long time. Coal and natural gas plants can easily run for 50 years, and nuclear plants can be updated and retrofitted to run for 60 years. This has profound implications for the cost of electricity on a per megawatt hour basis that seemingly no one is talking about. When the federal government puts out their cost projections for energy, the numbers they produce are called the Levelized Cost of Energy, or LCOE. These numbers are supposed to act as a measuring stick that allows policymakers to determine which energy sources will best serve their needs, but these numbers are wrong because they assume all power plants, whether they are wind, coal, natural gas, or nuclear will have a 30-year payback period. This does two things, it artificially reduces the cost of wind power by allowing them to spread their costs over 30 years, when 20 would be much more appropriate, and it artificially inflates the cost of coal, natural gas, and nuclear by not calculating the cost over the entirety of their reasonable lifetimes. The US space agency Nasa has landed a new robot on Mars after a dramatic seven-minute plunge to the surface of the Red Planet. The InSight probe aims to study the world’s deep interior, and make it the only planet – apart from Earth – that has been examined in this way. Confirmation of touchdown came through on cue at 19:53 GMT. It ended an anxious wait in which the robot radioed home a series of updates on its descent. Nasa’s mission control at California’s Jet Propulsion Laboratory (JPL) erupted into cheers when it became clear InSight was safe on the ground. Japan’s new minister in charge of cybersecurity made a startling admission on Wednesday: he doesn’t actually use computers. “Since I was 25, I have been in a position of authority where secretaries and employees handle such tasks for me,” Yoshitaka Sakurada, 68, told a Lower House cabinet committee meeting, per The Japan Times. To be fair, that is the best way to be secure with computers. Well, duh. I saw Terminator. Robots could become radicalised if they are badly coded, an expert has warned. Professor of electrical and computer engineering Subhash Kak from Oklahoma University believes robots could become mass murderers if they are not wired correctly. Although the danger does not exist with the current technology, Dr Kak believes future technical malfunctions could put thousands of peoples’ lives at risk. Earlier this year he issued another chilling warning saying that the machine takeover will lead mankind into a ‘hellish dystopia’. These are intentional, repeated attacks. They have to be stopped. (CNN) They’ve been described as “sonic attacks” — bizarre, unexplained head injuries that spurred the United States to bring home diplomatic staff from China and Cuba. Now scientists are saying the ailments could have been caused by microwave weapons. The satellite, launched in October 2017, has displayed behavior “inconsistent with anything seen before from” the kind of satellite Russia has said it is, according to Assistant Secretary of State for Arms Control, Verification, and Compliance Yleem D.S. Poblete. Instead, without saying it outright, Poblete implied that the object could be a weapon, but said the U.S. cannot know for sure. “We don’t know for certain what it is, and there is no way to verify it,” Poblete said yesterday in Geneva, Switzerland, at the Conference on Disarmament. Poblete was speaking before the international body for negotiating arms control to express the U.S.’s “serious concerns” about Russia’s push to launch weapons in space, especially anti-satellite weapons that can target satellites that the U.S. relies on for business, scientific and military purposes.